When it’s getting dark at 4 o’clock in the evening and the drive home is flecked with rain that might just be snow. Or when you’ve been in all day with the wind is howling outside and it is absolutely freezing. You want something quick and tasty for dinner, but add to this the warm glow that comes from realising that Christmas and the holidays are only three weeks away. If you, like me, haven’t done any Christmas shopping, put up your tree or sent cards, then this recipe is for you. It will inject you with a little bit of a Holiday Season kick, to push you on your merry way. I have updated the cranberry sauce in this recipe from the one used in the Chicken with Cranberry Sauce, as while you can use leftover cranberry sauce this is much better with added chilli and cinnamon. This time I cooked the Cranberry Sauce separately from the chicken, which I grilled for a healthier touch. For the cranberry sauce, I added the following ingredients to a pan, and leave to simmer for 15 minutes. 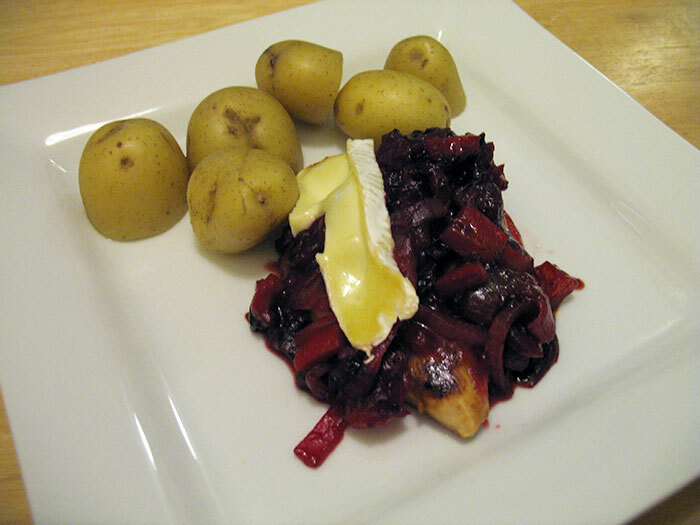 In the grill pan, once the chicken has cooked through cover each breast with the cranberry sauce, then place a thin slice of brie on top. If your grill pan has a lid then cover it and cook until the brie starts to melt, if not put it under the grill (or broiler). Chicken and Cranberry is one of my favourite meals, but adding the cinnamon and chilli gives it a great lift. I would have this every night if I could.